This Fleece Eggs are quick to make. 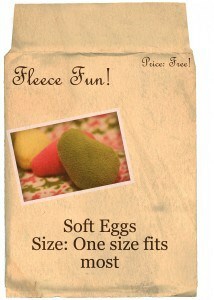 You can make Fun fleece eggs that kids love to play with. Download the free patterns here. For simple Egg – With right sides together, stitch close to the edge (1/4) using outside of presser foot as guide – leave 1 1/2 inch opening for turning . For 3 D egg – With right sides together sew 2 pieces together from top of egg to bottom of egg. Tip: I like to mark where I will end my seam by using a different colored pins. Now open up the egg and pin the third side of the egg to the two raw edge sides of the egg (right side facing in) be sure to mark a gap that is 1 1/2 long for turning. Using presser foot edge as a guide sew around the egg – taking care not to catch material from the other side. 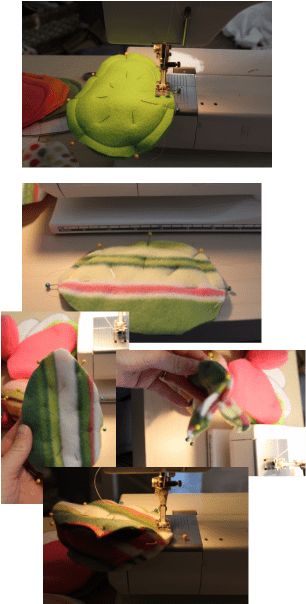 I like to start on the side of the egg, sew to the top, with my needle in the fabric flip the other side to the back and then continue down the other side of the egg. Turn the eggs right side out add poly fiber filling (you could also use fleece scraps for filling). Stuff to the firmness you prefer (I like them a little more firm) add a jingle bell to the center of the egg if you would like. (Kids love it when they make a little noise. Usually I avoid hand sewing like the plague, but there really isn’t any way around this one. 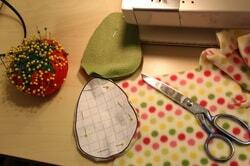 If you are unfamiliar with hand stitching a seam shut there is an excellent tutorial here.